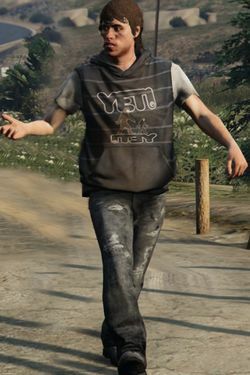 Elwood O'Neil is a character in the HD Universe who appears as a minor character in Grand Theft Auto V and a minor antagonist to Trevor Philips, attempting to steal his business and later trying to murder him. He is voiced by Matt Carlson. Elwood, along with his brothers Dale, Dalton, Dan, Daryl, Don, Doyle, Earl, Ernie, Ned, Walton and Wynn, were raised on a farm in Grapeseed, Blaine County. The brothers later used the farm to manufacture drugs and agreed to sell these to Triad leader Wei Cheng, beating their former acquaintance Trevor Philips to the agreement. Trevor, in retaliation, kills all but Elwood, Walton and Wynn, and destroys the farm. Elwood, Walton and Wynn plan their revenge and after locating Trevor in an apartment in Los Santos drive to the city and plan to launch a rocket propelled grenade into the apartment until being told that Trevor had moved out. They then head back to Blaine County, visiting Sandy Shores to kill Trevor at his trailer but can not locate him. They leave but are followed by Franklin Clinton and, while being chased, swerve off the road to avoiding hitting an elk. Franklin and Michael De Santa, working for Trevor, kill Elwood, Walton and Wynn as they attempt to escape in the woods of Raton Canyon. Elwood, the last remaining brother, attempts to destroy the helicopter holding Michael and Trevor with the rocket launcher but is killed by Franklin. This page was last modified on 4 March 2017, at 13:53.